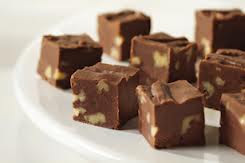 This is the easiest fudge and it is so good! We made it for Thanksgiving and you should try it-the platter was gone fast! The Fudge may even be a Christmas hit these next few weeks! Combine your butter or margarine, sugar and milk in a large saucepan, over low heat and bring them to a full boil. Stir this constantly. Continue the boiling for five minutes, stirring so you avoid any scorching. Add the remaining ingredients stirring vigorously to make sure all the particles are dissolved. If you don't do this you will either have chunks of marshmallow or chocolate. Before you pour this into your pan pour your nuts in the mixture if you want them. After, pour this into a greased 13 x 9-inch pan. Cool this completely. This makes about 3 lbs. of fudge.